Now with a third outing under his belt in the form of Uncharted 3: Drake’s Deception, Nathan Drake comes to an end, of sorts, in his journey. This series is one of the few unequivocal hits of the current generation in general and the Playstation 3 in particular, with one polished game after another, and strictly on that level, the latest game continues to uphold the tradition. Where it differs from the past titles however, is in the ways that it tries to rise above its breezy, pulp roots and while this attempt isn’t an unequivocal success on all fronts, it manages to make its mark where it counts. And kills lots and LOTS of people in that likeable way that Nathan Drake has that makes mass slaughter such a rascally thing to do. Uncharted 3 doesn’t even try to top the ridiculously gut-wrenching opening of Uncharted 2, which was probably a wise move, as just trying to escalate things would have felt both forced and ineffective. Instead, what we get in the story of UC3 is a more measured, considered examination of globe-hopping in the search of treasure. Nathan Drake and his previous companions are all put on a quest to uncover a great secret tied to the ring of Drake’s ancestral inspiration, Sir Francis Drake. It’s the same ring Drake has been wearing through all the previous games, but now we get a little more light shed on both it—and Nathan’s—origins. It’s a surprising turn for a game that’s been more concerned with a jaunty story, devil may care antics, and a carefree, adventurous disposition, but it feels like a question worth asking. After two previous games of globe-hopping, fire fights, near death of loved ones and destruction on a massive scale, it’s time to stop and ask “Is this really all worth it?” It’s a fascinating question that’s worth pointing at other adventurers we’ve known, most notably Indiana Jones, and at the end of the day, like Indy, Nathan Drake must find that answer for himself through some of the most harrowing action set-pieces seen in any game to date. If there is any complaint to be made about the story here, it’s that there is a certain, disappointing lack of confidence that comes at the end. After asking such weighty questions, and even taking some side-trips into gaming sequences that could almost be described as “expressionistic,” Naughty Dog slightly shies away from giving more substantial answers to the very problems they pose. That’s not to say the situation isn’t resolved, it’s just not resolved with the same seriousness that they used in creating the situation and asking their questions. The presentation of Uncharted 3 has never really been in question. Graphically, the game is absurdly beautiful, although it’s becoming evident how close to the resource ceiling Naughty Dog has come with this title. The environments are rich, varied, complex, and in some ways have forgotten the lessons learned in Uncharted 2 with a return to abundant detail that can occasionally overwhelm the eye. The character designs are top notch, with some mild, but noticeable tweaks to all major players, and the lighting has gotten a boost with some phenomenal shadows and occasional “God Ray” effect for some striking environmental moments. The frame-rate of the game is steady and never drops significantly, which in itself is a stunning achievement when a few of the environments have so many moving parts on top of the enemies themselves all firing and navigating. The only minor blemish on this otherwise fantastic visual experience is the occasional pop in of low-res textures into more proper, higher resolutions as you get close, likely a side-effect of the near constant streaming the engine is using to pull off its phenomenal visuals. The audio side is, quite simply, perfect. The writing is smart, snappy and beautifully delivered, with some acting moments providing some great performances regardless of medium. The music continues to use some signature melodies from the series—with the Drake theme itself now almost as iconic amongst gamers as the Indiana Jones theme. There’s also the usual inclusion of ethnic instruments weaved into the melodies, this time out mostly of the Middle-Eastern variety in keeping with the desert theme, and there are obvious riffs to a more epic score in evoking the Lawrence of Arabia references that inspired the game. The sound effects are, as usual, immaculate. With all the environmental soundscapes like ships wrenching themselves, French chateaus going down in flames, and of course gunfire coming from every conceivable direction, the audio manages to distinguish itself by being rich, punchy and discrete when it needs to be. This is another one of those games that will impress bystanders during set-pieces with how overwhelming it can get. Uncharted 2 was considered the apex of gameplay at the time of its release, particularly in the cinematic department. 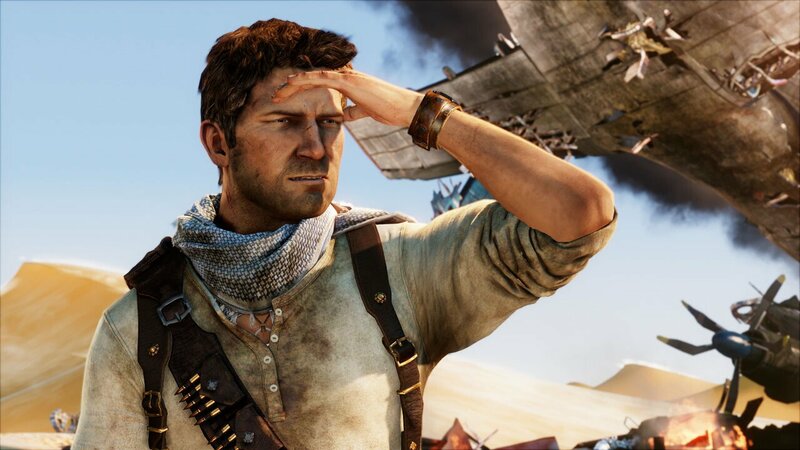 While Uncharted 3 comes close, it doesn’t actually manage to surpass its predecessor. There’s a balancing act of various elements that the previous game managed to get exactly right, which UC3, in a bold attempt to experiment, occasionally fails to capture. On the plus side, the action set-pieces do manage to outdo UC2, with some truly crazy sequences that will leave players likely breathless over what they just saw and did. The ship and plane sequences in particular are incredibly memorable. There’s also the previously mentioned attempt at some communication of character and emotional states through gameplay, which provides interesting break ups to the tension in ways similar to Drake’s visit to the Himalayan village in UC2. Another nice thing Naughty Dog has done is throw a metaphorical bone at the Tomb Raider fans in the crowd with a new focus on some meatier, more complex puzzles that will actually make players have to stop, think and do some genuine problem solving in order to get through. On the multi-player side there’s almost nothing but improvement overall. The co-op mode from UC2 makes a return with numerous tweaks to its various modes to make both the story co-op mode and its survival modes a true exercise in cooperation. Players in more of a team mood will definitely see how harrowing the escalating horde-like mode can be, while the story-mode manages to keep up a surprising amount of snappy banter from the original voice actors integrated into the proceedings. The competitive multi-player manages once again to provide a solid foundation and slight twist to the now standard COD-ish convention of XP used to unlock perks. Players can pick a variety of weapons and skills, some of which can be activated at the press of a button, or used passively to buttress performance. The maps provide a thoughtful amount of variety and verticality to the combat, with ledge hanging kills still a favourite for those who prefer a dash of humiliation to spice up their kills, and there are now opportunities for losing teams to be granted certain mercy conditions that can allow them to quickly regain lost ground if they’re not completely hopeless at competitive online play. Of course, because of the levelling-based nature of gameplay,there’s still a certain frustration and even tedium that might be experienced by newer players as they find themselves dramatically outclassed by higher level players. The only solution is to knuckle down, get the XP required and start unlocking those skills, but that’s pretty much standard in any competitive multi-player game today. On the whole though, UC3’s online component manages to tweak what was working in UC2 and improve on it enough that the multi-player for UC3 is likely to be played for a long time to come. Fans of the last game can rest easy in the knowledge that they can safely migrate to the new game and still enjoy a quality online experience. Overall, there’s very little about Uncharted 3 that doesn’t pass with flying colours. For many PS3 owners this is a game of the year contender, and certainly one of the best action games of the year. For PS3 owners with any kind of interest in the action genre this is pretty much a mandatory addition to the library. The assurance and technical experience of Naughty Dog is on show in every pore of the game. Some minor combat and timing issues keep it from surpassing Uncharted 2’s breathless pace, but the set-pieces set new standards for the genre, and the surprising depth they’ve added to the characters makes it clear that Naughty Dog is thinking beyond the simple popcorn premise the series is based on. It will be interesting to see what new directions they take the franchise in now that Drake has had some character development and even a little bit of closure added to his rogue-ish smile and daredevil antics, but if Nathan Drake does decide to take a breather until the next generation of Playstation console comes out, this is definitely a fine place to stop. 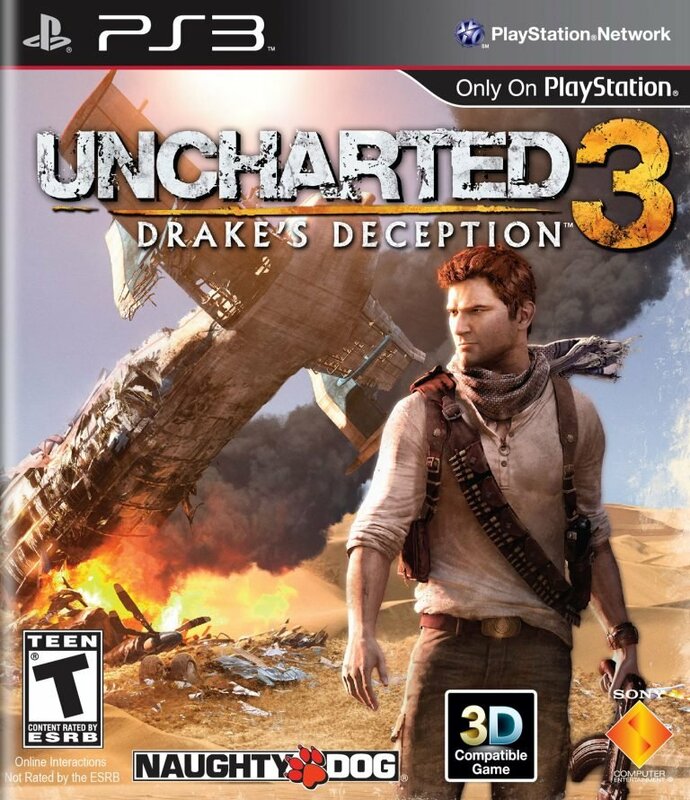 Now with a third outing under his belt in the form of Uncharted 3: Drake’s Deception, Nathan Drake comes to an end, of sorts, in his journey.